If you saw Marvel's Black Panther in theaters over the weekend and thought to yourself, "Why aren't there more Black Panther games?" Well, you're not alone. 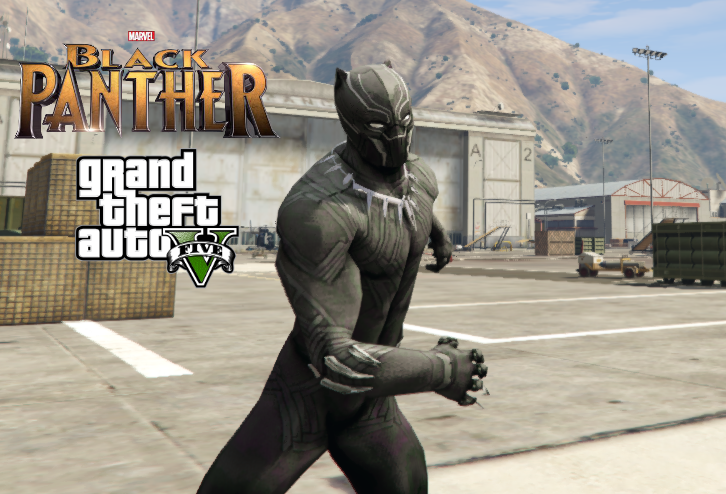 And while we don't have a Black Panther game to point you into the direction to (yet), you can always go ahead and download this Grand Theft Auto 5 mod for a pretty accurate Black Panther outfit. The mod was created by GTA V modder "Meth0d" whose other mods include The Winter Soldier and Neo from The Matrix. Compared to some other Black Panther mods online, Meth0d's is by far the most accurate, and specifically based off of Black Panther's Captain America: Civil War appearance. Depending on how you feel about T'Challa's outfit change in the Black Panther film, this might be good news or bad news. Superhero mods in GTA V have been popular since the mod scene first blossomed in the game. The Iron Man mod for example is one of the most popular mods in the game, considering the mod can be customized to recreate Iron Man's boot thrusters. The Black Panther mod for its part doesn't come with any unique abilities, but can be combined with other superpower mods to make an accurate approximation of Black Panther's abilities. Like super strength, super speed, super jump, etc. No word on whether or not Meth0d will be making an update to their Black Panther mod considering that they haven't made a mod for GTA V since June 2017. Rest assured, it will only be a matter of time until other modders take on the chance to deliver a more recent Black Panther outfit into GTAV. Black Panther is the latest Marvel superhero film to be a part of Marvel's Cinematic Universe. The film, directed by Ryan Coogler and starring Chadwick Boseman, Michael B. Jordan, and Lupita Nyong'o, had a record-breaking opening weekend generating $201.7 million in North America. The film is expected to break holiday records for President's Day weekend. So even if there aren't plans for a Black Panther game, maybe we can at least hope for a Wakanda mod down the road. Tagged with Marvel,	Marvel Entertainment,	mod,	News,	PC,	Rockstar Games,	Take-Two Interactive Software.